The meaning of the word Gebogan in Balinese means “sum”. Why did this special offering call Gebogan? Because this offering consists of different colors and various fruits and snacks those are originated from the earth. 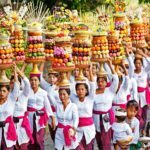 The philosophy of Gebogan as an offering is also seen from its towering form like mountains, the more upward the more narrow (taper), and above it also placed Canang Sari (Flower) as a symbol of our gratitude to God as the universal creator. Gebogan is usually made by Balinese mothers and girls. 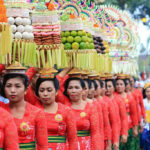 The elements contained in Gebongan are various kinds of fruits, snacks, flowers, Sampiyan, Canang Sari that are placed in Dulang. 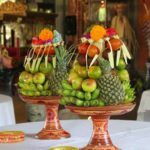 The ingredients are inserted into a small banana tree so as not to fall and are prepared according to the people’s creativity. Lastly, the fruits are placed on the flowers arranged on a leafy, square-colored wicker called Canang sari. Before the Gebogan offers to the God, firstly it will be paraded around the temple area where the religious event was held. This event is called Mepe’ed. In the Mepe’ed event the mothers will walk side by side forming a long line with Gebogan over their heads. This event aims to show the greatness of God who has bestowed so many different foods for life for the people. The height of Gebogan / Pajegan depends on the sincerity and ability of each individual to make Gebogan, because the value of Gebogan / Pajegan is not measured from high or low but from the sharpness of the heart in showing gratitude. And the rest is a form of art appreciation.